I recently bought a new calendar, themed "Calm Down and Have a Cocktail", and it comes with cocktail recipes for each month. I thought I'd share this month's drink: the Blizzard Martini. Pour ingredients into shaker filled with ice. Shake well, pour into martini glass. Garnish with shredded coconut. hehe! "Calm down and have a cocktail!" that can be my new little motto! awesome blog! 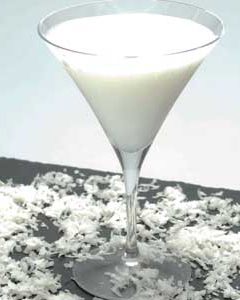 This blizzard martini is perfect for the Chicago snowfall that's predicted today! Hey how divine and royal! I just created a new cocktail with my current fixation drink Crush cream soda. Sounds like a good idea for a cold January. It's a little early but that looks amazing! Hm...if only I could drink -cough- This looks so cool! The chocolate cocktails are good! But they make my stomach hurt lol. Sounds like a fun calendar! i swear, im gonna try this at home. this martini looks so delicious! making this tonight! i'm serious. Uhhh YUM, I most def. need to try this delish drink! !